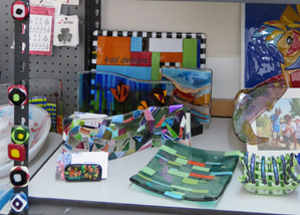 The KDD Fused Glass studio delights the eye with samples of items visitors could make. When Kathi Dougherty opens the garage door of her Fort Collins home, guests are in for a treat. Brightly colored glass sits on shelves and hangs from pegboards all around the walls. 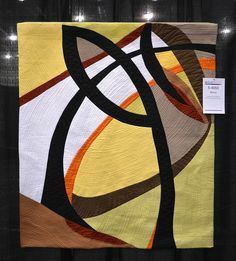 The designs, the shapes, the mix of colors give new meaning to the expression eye candy. This is the KDD Fused Glass studio, where Kathi works and shares her passion with others. When I joined a group of women for a creative evening at Kathi’s studio, fused glass was a new concept to me – and it seemed like magic. A friend carefully placed each piece of colored glass on and around a clear glass base the night I visited Kathi Dougherty’s studio. All right, so glass melts. 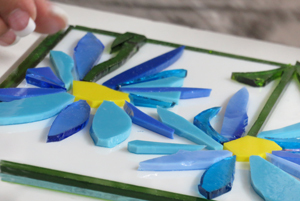 You cut shapes of different colors of glass and lay them beside each other and on top of each other to create the design you want. Then you put your creation in the kiln where the temperature gets so hot the glass starts to melt. Hours later after it’s cooled, you pull your creation out of the kiln and – ta dah – all the pieces of glass have become one. Fused, I mean. The pieces on top have melted down into the pieces below, and sharp edges have disappeared. How is it that glass strips lying side by side melt against each other without flowing into each other? How is it that the top layer of glass melts down into the pieces below, and yet those underlying pieces maintain their shape? And how is it that razor-like edges melt into finger-friendly curves, but the overall size of the work remains the same? And what you do can get pretty complicated. That’s because fusing glass is not like baking cookies. Never mind that glass needs four times the heat that cookie dough does. When I turn my oven on, it lets me tell it what temperature I’d like. Then it takes its own time about heating up and lets me know when it’s good and ready. 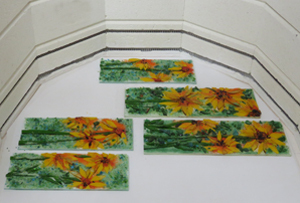 Decorative glass designs await firing in the kiln at the KDD Fused Glass studio. 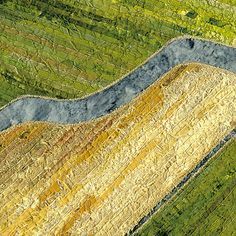 Although they follow one theme, Kathi Dougherty has made each one unique. But Kathi’s kiln lets her be supreme boss. She tells it not only how hot to get but also how fast to get that hot. Then she tells it how long to stay that hot before getting even hotter – and of course she tells it how fast to get to that next temperature too. This process goes on and on, until the kiln knows all the steps to produce a perfect glass product. Depending on the project, that could include six or even eight temperature settings, with speed and holding time for each. Those settings keep getting higher and higher – then lower and lower. Good thing the kiln has a computer to remember it all. Of course, fused glass has been around a lot longer than computers. In fact, it goes back thousands of years. Considering the careful temperature control required to make a strong piece, reading about the discovery of fused glass among ancient ruins of Rome and Egypt astounds me as much as the beautiful pieces Kathi pulls from her kiln. 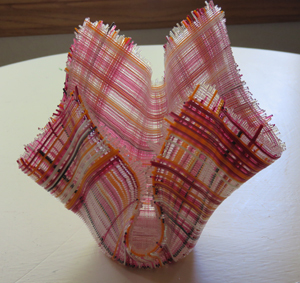 This woven glass bowl by Kathi Dougherty formed when gravity pulled down the corners of a flat piece of fused glass as it lay on top of a metal container in a hot kiln. The night that I first visited KDD Fused Glass studio, two small bowls of woven glass occupied a prominent position in Kathi’s colorful studio. Totally intrigued, I bent my head this way and that to try to understand exactly what I was looking at. If you could take a plaid cotton napkin, fringed along all the edges, and turn it into glass, that’s just about how it would look. Woven glass . . . Really? As usual with magic, illusion was at work. 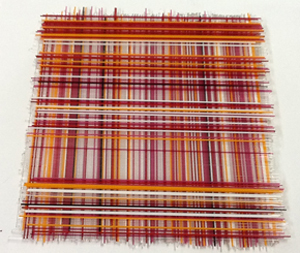 Colorful glass rods, carefully placed in layers perpendicular to each other, had sunk and fused together, creating a translucent mesh that truly looks woven. I thought the most magical part of the process was getting the carefully arranged glass rods to the kiln without having them roll and slide into one disorganized mass. The secret, Kathi told me, is hairspray. 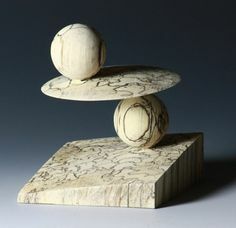 Just a drop of the non-aerosol variety strategically placed at the corners works like glue but burns off in the kiln. One firing had turned the layers of rods into a single flat piece of glass. After it cooled, Kathi had balanced the flat, fused glass on top of a metal container inside the kiln. A second firing allowed the corners of the glass to slump way down over the edges of the container. 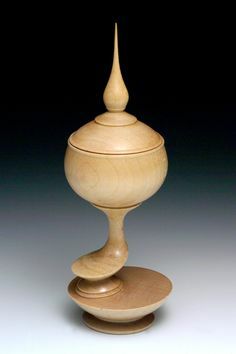 Sometimes glass becomes a bowl by slumping down into a form and sometimes by slumping over the top of one. Either way, it’s physics – heat and gravity do the work. 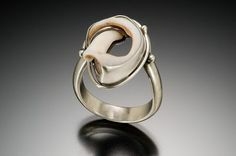 Kathi will be at the Meet the Artists show in Frisco’s historical park on September 6 and 7. She frequently attends art festivals along the Front Range. Click dates in red on her calendar on her home page to see where she will be next. 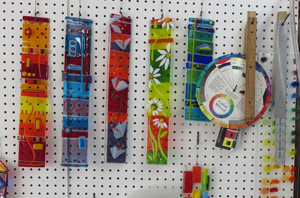 The KDD Fused Glass studio displays a variety of designs and colors to inspire visitors. 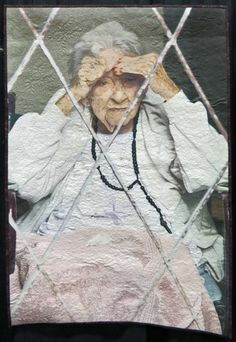 You can see her fused glass any day by visiting Trimble Court in Fort Collins, just off Old Town Square. Kathi will be there herself on Friday, September 12, from 2:00 until 8:00 p.m. Interested in getting even deeper into the magic of glass? Kathi opens her studio for others to use her glass, tools, and kilns in classes, for parties, and on “open studio” days. Find out more at KDDFusedGlass.com. Your comments are welcome. Click “reply” at the top left of this page. 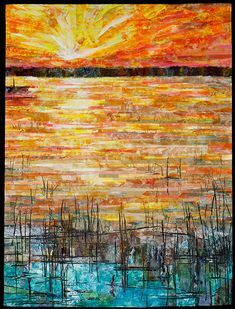 This entry was posted in Glass and tagged Fort Collins, fused glass, Kathi Dougherty, kiln on September 3, 2014 by Sally. Beautiful and very nicely written as usual. These artists are very very talented people. Yes, they are indeed talented. Learning how they produce their work makes me appreciate that fully.